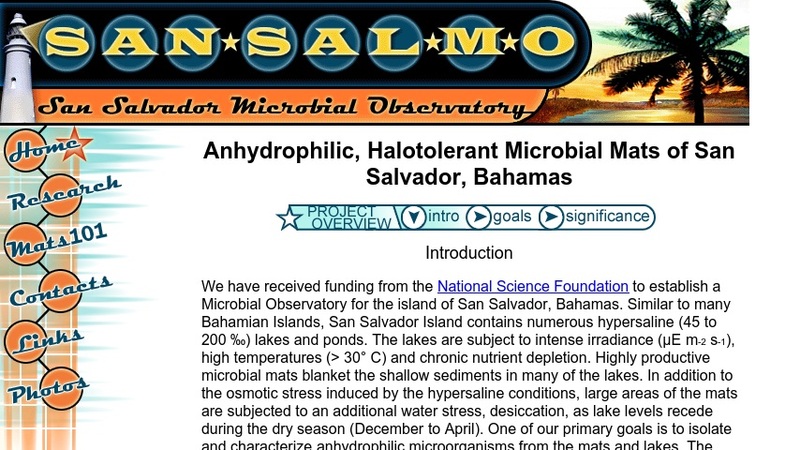 This web site is home of the San Salvador Microbial Observatory, a project investigating the anhydrophilic, halotolerant microbial mats of San Salvador, Bahamas. This project has been developed to address the influence water availability has on structural diversification, community composition, production, and carbon sequestration in microbial mats. The web site includes general information about the project, a research description plan, an introduction to microbial mats, links to other microbial observatories and interesting sites, and a collection of photos. This is a helpful resource for those investigating microbial mat communities.